I was on my last few hours of my open studio event recently, when in walks a woman who begins to tell me a story about how her father had gotten funding to study the presence of a naturally occurring form of glass in the desert of Libya in the ’50’s. I was hooked because….well….chemistry, that’s why. And….glass of course! But the temperatures! My God! To melt pure silica you need temperatures in excess of 3100° Fahrenheit. It’s hotter than even the best constructed open air fire could hope to reach on earth. Without going into great detail, the types of magmas found coming up out of the earth have temperature ranges that depend on their mineral content. High silica magma, like the glass found in Libya, is recorded with a high mean temperature of 1472° Farenenheit. This is called Felsic magma and it’s lower temperatures are due to how magma, we believe, is formed in the earth, which is that iron is melted first, and then flows up through cracks and fissures in the earth into what we know to be volcanos and volcanic vents. As a result of this, sand, which we think lies at layers higher up, only tends to get a lesser heating effect so that it’s average temperature is lower than iron rich magma, whose temperatures are much higher. Comparing the melting point of silica and it’s average melt temperature through natural means yields us a very broad temperature disparity. What gives? How on earth could this glass have been formed here so close to the surface of the earth where so much of this material has been found? First, you should know that glass (or silica) does not have a discreet melting temperature. Instead, it has what we call a melting range. It’s not unlike how honey will change viscosity from thick to thin all depending on the temperature that is affecting it. So while silica forms a perfect union all on its own of a glass we call quartz glass (nearly pure silica) at 3100° F. it begins to go into a glass phase at lower temperatures. At 14-1500° F. silica is glass-like, but it’s also very much sand-like, too. You would look at it and tell that its a very crude form of glass (very unlike the glass found in Libya). The question on everyone’s mind has been, how did this Libyan desert glass form to begin with? First, there are a lot of theories. One theory is that the silica was heated in our atmosphere as a result of a comet that fell to earth millions of years ago. This, the theory goes, was what created the extraordinary heat necessary to melt the silica. But there are problems with this theory. A body falling to earth only takes a few minutes to go from our upper atmosphere to the surface of the earth, which may not be nearly enough time to heat up a comet and fuse the quartz into the glass that has been discovered on the desert floor. To make glass like what my visitorsfather studied in the ’50’s, you need enough time to really get the melt right. A meteor can enter our upper atmosphere and fall to earth within 15 minutes time (or less). Hardly enough time to get the silica cooking deep down in a comet. Another theory is that the silica was heated by volcanic means. Normally, however, we wind up seeing either basalt glasses, or very crude lower temperature glasses of the kind I described earlier. The Libyan glass is different from both of these kinds of volcanic glasses. So as a result, researchers who have been studying this for a while now have looked at the region and have offered a new theory. When researchers began to study the geology of this area they found evidence of ancient volcanic activity. in fact in what they considered to be the bullseye of where most of the glass is found they also found a corresponding evidence of ancient volcanic activity in exactly the same area. 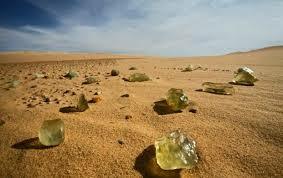 Normally volcanic activity is not enough to melt silica into the type of glass that we find in the Libyan Desert glass. There is a process however where silica can be heated over and over many times in order to create glass from silica. Researchers posit that the glass was made through a process called sol-gel which consists of small silica particles that melt and then slowly form glass, a process that could take many years of repeated heating and cooling in order to form a solid glass. One example of a sol-gel that you might be familiar with are opals, which are silica based particles along with other minerals that are repeatedly heated in volcanic vents that form the gems with rainbow colors that we know so well. The reason why the Libyan glass does not look like opals is because the conditions and the substance of the silica beds were very different than the ones in Australia that produce opals (which is a sol-gel process). This theory offers the most likely possibility for how the Libyan glass was formed. While we can never be completely sure, it seems that in this one place on earth conditions were right many millions of years ago for this unique form of glass to be created. I’m very thankful to have had such an interesting conversation with Robin who first told me about her father’s work because it put me on the path of a great mystery that lies in the sands of the Libyan desert. And of course, since it’s about glass, it naturally piqued my interest!